We will announce a schedule of our 2019 youth programs here shortly. You can explore our past year’s program below. Like us on facebook to stay up to date on the latest scheduling news. Click here to see past youth programs. 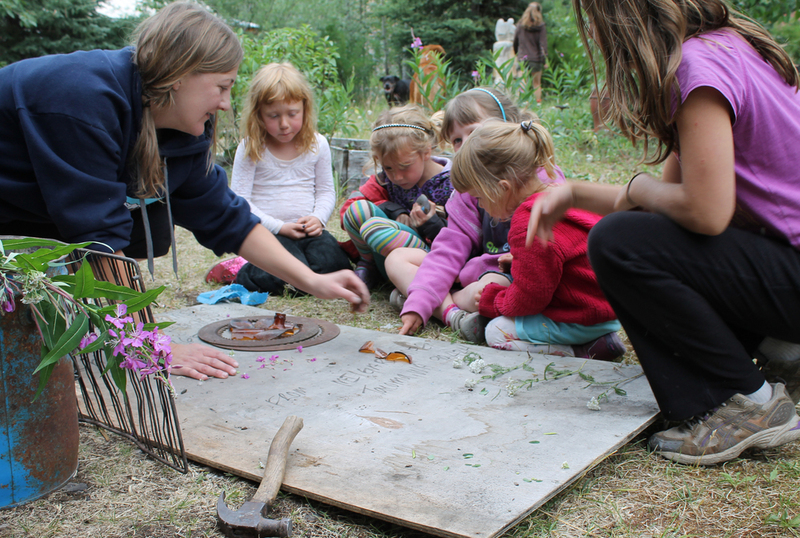 Mountain Arts for Youth: programs invite school aged youth to join artists and naturalists for a series of summer arts workshops for kids designed to connect them with the natural world around them. Program Director Lara Applebaum. $5 per participant. All programs meet from 1-4 pm at Porphyry Place in McCarthy, unless otherwise specified. Friday, 7/6: Predators and Prey - Learn about the interconnections of local animals in relation to the food chain with Elizabeth Schafer. Monday, 7/9: Painting with Alcohol Ink - Naomi Young returns to teach alcohol ink painting on canvas. Join local educators and scientists for a campout along the Root Glacier Trail. Explore and learn in your surroundings about glaciology and its relationship with the neighboring boreal forest. Adult chaperone required for elementary school participants. Monday, 7/16: Stained Glass Mosaics - Gina Merlino will lead us in crafting stained glass mosaics inspired by the beauty of the Wrangell Mountains. Friday, 7/20: For the Birds - Observe birds, play bird bingo, learn about “preening,” and make a bird mobile and your own birdwatching binoculars with Stefanie Tschappat. Monday, 7/23 Printmaking - Learn about a specific type of printmaking, gelatin monoprinting, with Robin Child. Create an accordion book of layered prints from found objects and textures as well as homemade stencils. Friday, 7/27: Magnetism - Cynthia Shidner will teach us about the scientific method with magnets. Geared towards early elementary school aged youth. Monday, 7/30: Macro Painting - Join Lara Applebaum as we create macro paintings to illustrate another perspective of common natural elements. Kids Making History, July 1st, Meet at 1 pm at the McCarthy-Kennicott Historical Museum. For the 8th year running, The WMC will partner with the McCarthy-Kennicott Historical Museum for this afternoon event. We’ll start at the Museum for a look at what kids did back when McCarthy was an active mining town. From there a guest historian will lead the group on a walking tour of downtown with an emphasis on what it was like to be a kid in McCarthy years ago. Back at the WMC, the group will document their own stories. This information will be archived at the museum--helping to create a living document of today’s Kennecott Kids. All ages of children are welcome to join us in learning about McCarthy while also documenting their own moments in history! $5 per participant.